As I began studying the topic I discovered two unexpected things: first, the church was much more influential in the history of healthcare than I had expected; and second, the modern hospital can be traced directly back to ancient and medieval Christian institutions. Something else struck me: far from the stereotype of shriveled ascetics who hated the body, early Christian teachers valued the body and the medical arts necessary to heal it as good gifts from God (see “Did you know,” inside front cover). Balancing this was another positive value: that of being in relationship with a ­loving God. Doctors are good, but the Great Shepherd is better; whatever happens in our bodies, the real prize is not physical health or a prolonged life, but rather the eternal enjoyment of our relationship with him. These twin values played out in the amazing reaction of the early Christians to the plagues that ravaged their world. Experts tell us we are still at risk of global pandemic. In such an event, would we respond as the early Christians did, who cared for plague victims heedless of risk? (See “A new era in Roman healthcare,” p. 6.) Would we put God’s love for others above even our lives, as they did? So many challenging stories emerged as the editorial team researched and the authors wrote this issue: ­Stories of wealthy Christian women who gave up all this world’s comforts to care for those suffering the most ­repellant illnesses. Of popes and bishops who poured the church’s resources into founding proto-hospitals to aid the sick poor. Of monks who learned the medical arts to help both their own communities and needy ­visitors. Of friars who lived in leper colonies, serving the lepers and kissing their faces. It’s hard to remember, walking the gleaming halls of today’s secular hospitals, how this institution grew up in the midst of the church. Hard to remember in the world of the HMO how the first hospitals were founded on the belief that all people, no matter how poor, are made in the image of God and deserve care. 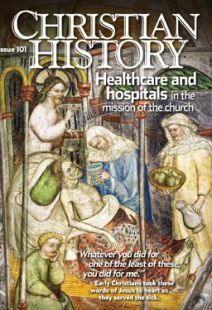 Although historically hospitals were often founded and funded by religious orders or through the beneficence of Christian donors (see “The charitable revolution,” p. 33), today the secular, publicly funded hospital is the rule, with even the many and important Catholic hospitals now under secular administration. The clock is unlikely to be turned back on this trend, but perhaps the stories told here of early faith-based xenodocheia and medieval hospices (see “From poorhouse to hospital,” p. 16) can still help us toward new answers: How can healthcare workers bring their faith to bear within today’s secular institutions? How can family members and ministers help patients to negotiate the maze of the twenty-first-century healthcare system while keeping a sense of God’s presence in the process of healing? How should the church respond to the devastating epidemics of the new “global village”? As in so many areas, there is still much to learn from our forebears. Christian History thanks Dr. Gary Ferngren, who served as this issue’s topic advisor, and Dr. ­Darrel Amundsen, who also read manuscripts and gave ­advice during the issue’s preparation. Of course, they are not to be blamed for any errors that may be found in our presentation of the topic, but the issue has been ­immeasurably strengthened by their contributions.